Two kings, Three young soldiers. One battle to end all battles. Eager to prove his courage and defend his family honour, young Irish noble Gerald O'Connor rides his warhorse Troy north in King James’s cavalry. Brothers Robert and Daniel Sherrard march south from the once-besieged city of Derry with King William’s army. 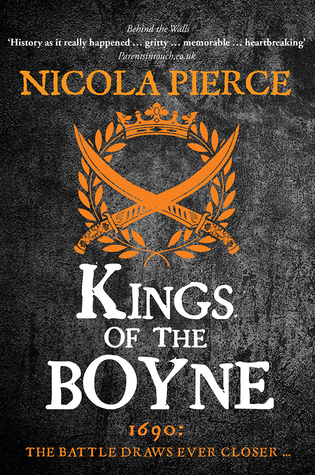 The chosen field of battle – the Boyne – lies waiting, where victory will decide who rules the lands of England, and of Ireland. And the fighting will decide who survives the deadly game of war. Review: This book is a historical novel based on the lead up, the battle itself and the immediate aftermath of the Battle of the Boyne in July 1690. The battle was fought just outside Drogheda in Ireland between two armies commanded, respectively, by James II of England (and VII of Scotland) and William III. Just 20 months earlier, James had been deposed by what has come to be known as the Glorious Revolution, and the throne had been offered jointly to William and his wife Mary. James was Mary's father, but he was also William's uncle. James went into exile in France but the following year, with the support of Louis XIV of France, he landed in Ireland with French soldiers and raised an Irish army with the aim of reclaiming his throne. The book's title comes from the fact that the battle was the last time two crowned kings of Britain commanded opposing armies. Interwoven into the account of the battle are the stories of four young soldiers, two on each side. Robert and Daniel Sherrard, two brothers from Londonderry, who featured in a previous book by the author based on the siege of Londonderry entitled Behind the Walls, are infantrymen in the Williamite army, whilst Gerald O'Connor and his friend Jacques are cavalrymen in the army of James, also known as the Jacobite army. The book is a dramatic account of the lead up to the battle and of the battle itself, and does not shy away from the brutal aspects of warfare and its effects on the civilian population. It also gives an insight into the political and religious motives behind the participants, of how the battle plans were drawn up and how these plans were executed on the day.